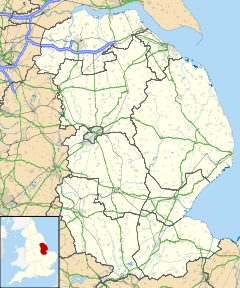 Thimbleby is a village and civil parish in the East Lindsey district of Lincolnshire, England. It is situated approximately 1 mile (1.6 km) west from the A158 road and the town of Horncastle. Thimbleby is listed in Domesday Book of 1086 as "Stimbelbi", with 67 households, which at the time was considered very large. The Lord of the Manor was King William I. The church is dedicated to Saint Margaret and is a Grade II listed building built of greenstone in 1744 to replace a medieval church on the same site, and was largely rebuilt in 1879 by James Fowler of Louth. It was closed in December 2010 due to unsafe stonework and electrical wiring. The village hall was built in 1856, originally as a school, and is Grade II listed. The old village pump survives, dating from 1857, standing in a three sided red-brick enclosure. There are several cottages, some mud and stud, some thatched, in Thimbleby, including White Cottage, dating from the 16th century, Rose Cottage, and The Cabin, both of which date from the 17th century, and the Old Manor dating from the 18th century. The village has a public house, The Durham Ox. ^ "Parish population 2011". Retrieved 19 August 2015. ^ "Domesday Map". Thimbleby. Anna Powell-Smith/University of Hull. Retrieved 19 June 2011. ^ a b "Church of St. Margaret, Thimbleby". British Listed Buildings. Retrieved 19 June 2011. ^ "Lincs to the Past". St Margarets Thimbleby. Lincolnshire Archives. Retrieved 19 June 2011. ^ "Village Hall, Thimbleby". British Listed Buildings. Retrieved 19 June 2011. ^ "Pump and Wall, Thimbleby". British Listed Buildings. Retrieved 19 June 2011. ^ "White Cottage, Thimbleby". British Listed Buildings. Retrieved 19 June 2011. ^ "Rose Cottage, Thimbleby". British Listed Buildings. Retrieved 19 June 2011. ^ "The Cabin, Thimbleby". British Listed Buildings. Retrieved 19 June 2011. ^ "The Old Manor, Thimbleby". British Listed Buildings. Retrieved 19 June 2011.